Published: Nov. 3, 2011 at 10:43 a.m.
Aaron Maybin has found new life in New York after struggling to establish himself as a first-round pick in Buffalo. 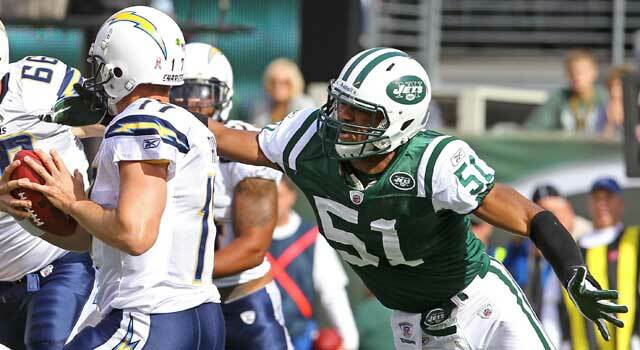 Jets outside linebacker/situational-pass rusher Aaron Maybin has three sacks since coming to the Jets. That's three more than he had in two seasons with the Bills, which is why he was released this preseason. Buffalo couldn't figure out what to do with the 2009 first-round draft pick. The Jets apparently have. Sunday, Maybin has a chance to show the Bills that he actually can play when New York and Buffalo square off in what could end up being a very important AFC East game. Maybin told reporters that he's had this game circled since catching on with the Jets -- for the second time in just over a month -- in late September. That's usually how it goes when a player faces an old team, especially one that brought him into the league and bailed on him when he deservedly earned being let go. Jets coach Rex Ryan is wise enough to know when to exploit any form of motivation -- as we saw when he started LaDainian Tomlinson against the Chargers in Week 7. Ryan also knows how to coach defense and create matchup advantages. That's what he's done with the 6-foot-4, 230-pound Maybin, a speedy pass rusher too slight to play every down. Maybin is incredibly explosive rushing off the edge and if he simply has to beat a running back or other less athletic impediment, he's got a chance, as long as he doesn't have to fully engage. Although he still has a lot of room to improve, Maybin's development as a pass rusher is encouraging. Besides the three sacks, he also has three forced fumbles, which is a trademark stat tracked by coaches when it comes to pass rushers. Where Ryan and Maybin have to be wary is not to get burned by the player's exuberance. The Bills have allowed just nine sacks -- second fewest in the NFL -- and Buffalo coach Chan Gailey is equally adept at exploiting matchups. Gailey could very easily give New York certain passing looks when Maybin is on the field and run or screen right at him. The key for Maybin and the Jets will be to play with a lead, or at least stay close with the Bills. If they get behind, then Buffalo will turn Fred Jackson loose and run the ball to kill the clock. That will keep Maybin off the field. Plus, if New York has to throw in an effort to rally, it will face the NFL's No. 1 team in terms of interceptions (14). Darlington: Who are the Steelers? The Ravens' 35-7 pillaging of Pittsburgh in Week 1 will have little to do with Round 2 at Heinz Field, other than giving the red-hot Steelers a little added incentive for some get-back and the Ravens' knowledge of Pittsburgh's vengeful intent. I've covered and followed too many Week 1 games when a team that's struggled against another puts all offseason into winning the opener only to fall flat when it matters most. Though Ravens fans rightfully think there are some flaws in the offense and with quarterback Joe Flacco, their second-half comeback against Arizona last week is the type of mental springboard they need heading into the Steelers' den. What could determine the outcome -- other than turnovers -- is how the Steelers deal with Baltimore's tight ends and running back Ray Rice in the passing game. In Baltimore's victory over the Steelers, tight ends Ed Dickson and Dennis Pitta combined for seven catches for 104 yards and a touchdown. Rice had four catches for 42 yards and a TD. In last week's victory over New England, the Steelers did a masterful job against the Patriots' receivers but tight ends Rob Gronkowski and Aaron Hernandez had nine catches for 103 yards and a touchdown. With linebackers James Harrison and LaMarr Woodley expected to be out with injuries, Pittsburgh might have to rely on their safeties and nickel backs in coverage, which could lead to mismatches or some deep opportunities for the Ravens. There is no way that Chargers quarterback Philip Rivers won't dwell on his botched snap that allowed Kansas City to tie San Diego for the AFC West lead (along with Oakland) on Monday night. That's one of those blunders a player can't erase, regardless of his mental toughness. And now Rivers has to face the Packers coming off a bye. Though Green Bay's defense ranks 28th in the league, leaving coaches a tad bothered as to why things haven't come together, defensive coordinator Dom Capers has had additional time to come up with ways to rattle Rivers. Not good for San Diego. Capers can plan for that because odds are good that Green Bay will stake its defense a lead and allow him to start playing games with a quarterback who seems to really be pressing. Helping Capers' causes are schemes in which the Packers tend to take out opposing tight ends (Antonio Gates) with linebacker Desmond Bishop and cornerback Charles Woodson. If they can disrupt Gates at the line of scrimmage and get Rivers looking elsewhere or at the pass rush, they've accomplish their mission. That clears their playmaking secondary to get after the ball. Though the overall defensive ranking is among the NFL's worst, the Packers are tied for second in the league in interceptions (13) -- two more than Rivers (11) has thrown in 2011.